Long zucchinis, round zucchinis, pattypan squash – count me in! This is not your mother’s zucchini story. I’m sure you were wondering, considering it is nigh on high summer and here we go again with the ubiquitous what-to-do-with-all-that-zucchini story. You’re expecting zucchini bread. And jokes about not leaving your car windows rolled down, lest a brown bag of overgrown zukes shows up on your seat. But I’m here to tell you that around these parts, we give zucchini — and all its elegant cousins in the summer squash family — a little respect. I think they are quite beautiful, and I am highly opinionated about how to cook them. Week before last I happened to be hanging around Morning Glory Farm when one of the harvest trucks came in with a big load of freshly picked summer squash. All of a sudden I was in a hive of young farm workers and surrounded by boxes and boxes of the most beautiful varieties of green and yellow squash — standard zucchinis, round green zucchinis, round yellow zucchinis, yellow pattypans (also known as scallop squash), yellow crookneck squash and more. It made me grin. Granted I’m a little obsessed with vegetables, but there’s just something about all those cheery shapes and colors when they first show up in July. And this year I’m only growing a limited amount of summer squash in my own market garden. I think I’ve planted Raven and Jackpot zucchini, Sunburst pattypan, and a pretty (and prolific) yellow squash with a green tip called Zephyr. But Morning Glory has a lot more varieties, including the fun baseball-shaped squashes. The dark green ones are a variety called 8 Ball; there’s a light green variety called Cue Ball and a mottled light green one called Lucky 8, as well as several yellow varieties including One Ball and Summer Ball. Summer squashes have all been hybridized so much that color and shape aside, you might not know what the flesh is like until you cut into one and cook with it. 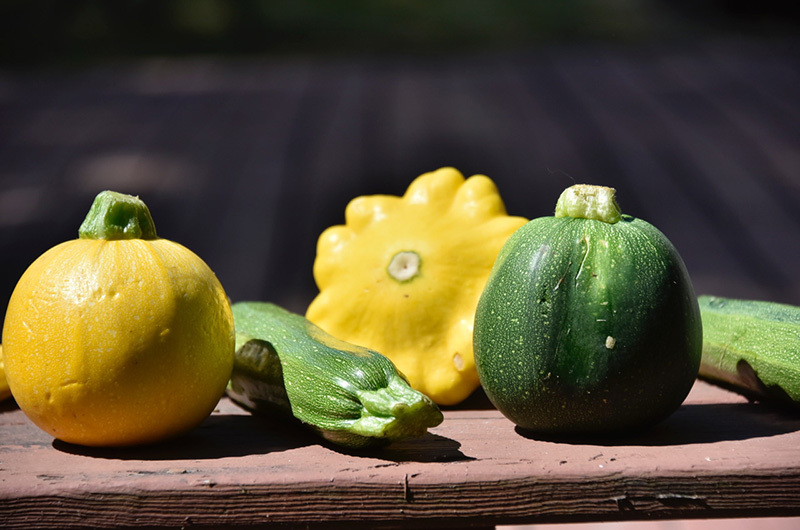 Generally speaking, traditional yellow summer squashes like the crookneck varieties have more seeds and a higher moisture content than the dark green zucchinis, which have denser flesh. But there are bright yellow zucchinis, too, like Goldmine and Yellowfin, which have that same dense flesh, which I prefer for cooking. (Pattypans have dense flesh, too.) No matter what the color or shape, I think size matters. I prefer smaller, younger summer squash because I think they have more flavor, and the seeds are less developed, leaving more of that dense flesh. Smaller squash also have a higher ratio of skin to flesh, and squash skin is the secret weapon that holds the flesh together when diced or sliced and tossed in the stir-fry pan or onto the grill. So about that grill. Long ago (25 years?) and far away (well, a couple states over), I worked in a restaurant called Al Forno in Providence, R.I. I was fresh out of culinary school, I had planted my first teeny tiny vegetable garden, and I was cooking in a restaurant where both the ovens and the grill were fueled by a wood fire. Al Forno’s husband and wife chefs, George Germon and Johanne Killeen, also did something that was a little unusual at the time: they bought as much as they could from local farms. Everything was fresh. I simultaneously fell in love with fresh vegetables and high-heat cooking, and the two have been entwined ever since. Summer squash loves high-heat cooking — grilling, roasting, broiling, stir-frying, sautéing. Its innately nutty flavor intensifies when it browns, and quick, hot cooking also helps caramelize the exterior while trapping some moisture inside the flesh. Low, slow or crowded cooking will send a message to your squash that it should begin to shed moisture like a drip hose. The only time that’s really a good thing is when you’re making a soup or perhaps a dish of braised vegetables. How you cut your squash is also key. For the grill, the longer the piece the better. You can cut the squash on a sharp diagonal (not too thickly — somewhere just past quarter-inch thick is good) or you can cut long planks. The easiest way to do this is to cut the squash in half first, trim the ends, and stand the two pieces up vertically on your cutting board in order to cut straight down. Be sure to brush the pieces with oil on both sides before grilling. That oil is what draws the heat to the inside of the squash to cook it through (while also helping the exterior to brown). For stir-frying or sautéing, cut squash into small or medium dice, which will cook quickly. (Slices tend to smother each other in the pan and start that whole water-shedding thing again.) Start with smallish squash so you have a lot of skin in the mix. (Small pattypans are great cut into wedges.) Crank up the heat and keep the squash moving until somewhat browned on all sides. For quick summer side dishes, I often cook diced zucchini this way, then add kernels from a couple fresh ears of corn and some minced garlic and cook for another minute or two. I take the pan off the heat and add chopped fresh basil, mint or cilantro and a good squeeze of lime or lemon. Pair squash with flavors it loves: A classic Mediterranean combination of sundried or roasted tomatoes, black olives, garlic and fresh basil (try in a vinaigrette for grilled or roasted squash); classic middle eastern spices like cumin and coriander (try in a sauté with chickpeas); bright citrus (lemon, lime or orange) and aromatics (ginger, shallots, garlic). Squash also has a natural affinity for creamy fresh cheeses like goat cheese and ricotta. I like to grill zucchini slices and roll them around a dollop of herbed goat cheese and a basil leaf. Over the years, I’ve developed a lot of different recipes using summer squash. I’ve made tarts, muffins, soups, salads, layered salads, pasta salads, bean salads, quinoa salads, tacos, frittatas and more. This summer at the top of my list is my friend Nicole Cabot’s take on zucchini fritters. Nicole, a West Tisbury private chef, first grates the zucchini, then squeezes out some of the liquid in a tea towel, and makes fritters with an egg, regular or gluten-free flour, feta cheese, garlic, salt and pepper. She adds some finely chopped kale or parsley and fries the fritters like latkes until brown. She serves them with mint and Mermaid Farm yogurt. 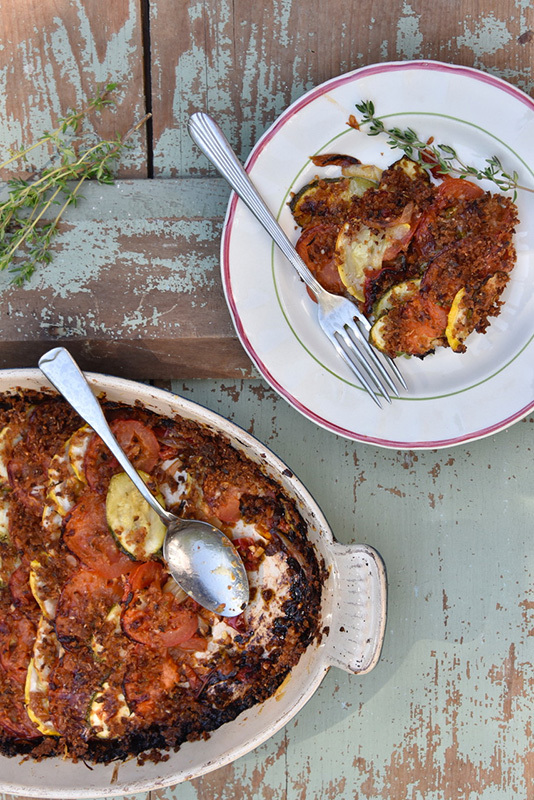 But I’d be remiss if I didn’t offer you a variation on one of the most popular zucchini recipes in my repertoire — a layered tomato, zucchini and parmesan tian. 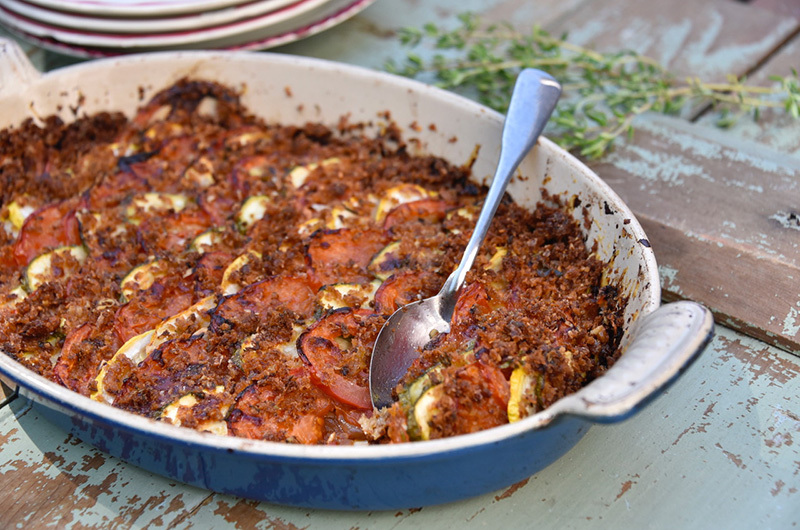 A tian is a Provencal-style vegetable gratin, so, no, I didn’t invent the darned thing. But my own particular take involves cooking the vegetables until all the juices have had a chance to reduce down and caramelize in the pan, where a bed of onions, leeks, peppers or other aromatics lies tucked underneath. The summer flavors are amazing, and the crunchy parmesan-bread crumb topping doesn’t hurt. It does almost feel like cheating, treating zucchini this way, but if you’re into crowd-pleasing and zucchini consumption, give the tian a try. 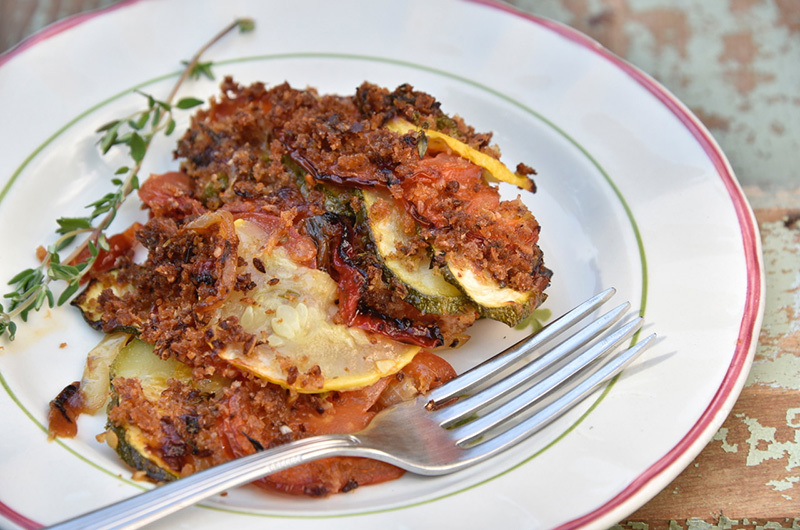 Recipe for Zucchini, Tomato, Parmesean and Bell Pepper Tian. I recall Al Forno with great fondness and appreciation. No wonder you can wax poetic about the graces of squash. I wish I had recipes galore!